The Slug C Cruiser is a surprisingly good ship that I rarely see getting much attention from the FTL community. I have it placed on my tier list in the "above average" category, at 9/28 overall. I think that this design tends to get overlooked because it lacks anything too flashy at its disposal. The main selling point of Slug C is that it's the only ship in the game to start with both Hacking and Mind Control. 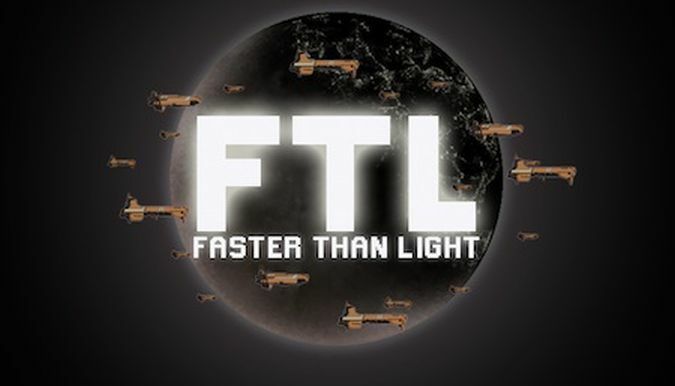 Hacking needs very little in the way of introduction, as a wildly versatile and arguably overpowered system added in the Advanced Edition of FTL. You can work wonders with Hacking, and in this game, sometimes you need to do so. Mind Control is significantly less useful, while still being a helpful addition to a ship layout. 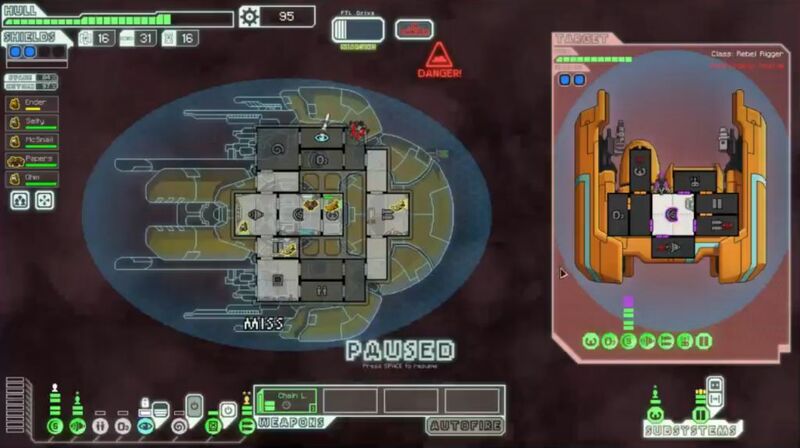 Mind Control can sometimes allow for enemy crew kills without the presence of a Teleporter, especially if the opposing ship is unfortunate enough to lack a Medbay or Cloning Bay. Mind Controlling the enemy pilot will take away some of the ship's evade, and the Slug C can combine Hacking + Mind Control in a truly devious way. Hack a key system like weapons or shields, then when someone goes inside to repair it, Mind Control them so that they damage the system further. Hacking will lock the doors of that room, making it temporarily impossible to stop them! Fun stuff. The biggest weakness of the Slug C is the starting weaponry. There's only a Chain Laser here, which means that any ship with the normal single shield layer can only take one point of damage at a time, and then only if both shots hit the target. The first Chain Laser volley is also quite slow, and if the weapon gets damaged or ionized offline, the slow chargeup time of the Chain Laser must begin all over again. The player must have intelligent usage of Hacking and Mind Control to work around the lack of direct damage capabilities. Those two systems also limit the total number of system slots available; you can add Cloaking or Drone Control to this ship, but not both. Take your pick. In any case, upgrading weaponry is the top priority for the Slug C out of the gate. I'm quite proud of how this run played out, it's a bit of a master class in using FTL's systems to their full effectiveness. I had poor luck with finding weapons on this occasion, coming across no stores in the first sector and a store that sold no weapons in Sector Two. No random weapon drops either. What I did purchase at that first store was a Cloaking unit, giving me access to Hacking + Mind Control + invisibility from a very early point in the game. This gave me all sorts of different options, even as my direct damage remained pitifully low. I had a blast strategizing each fight for maximum effectiveness, picking and choosing when to use each of the three systems. In particular, I needed to use Hacking on the shield unit of enemy ships once they started appearing with two shield bubbles, or else my Chain Laser would have been unable to deal any damage at all. I danced through Sector Three on a wing and a prayer, defeating ships with far stronger offense and defense through sheer twinkery. 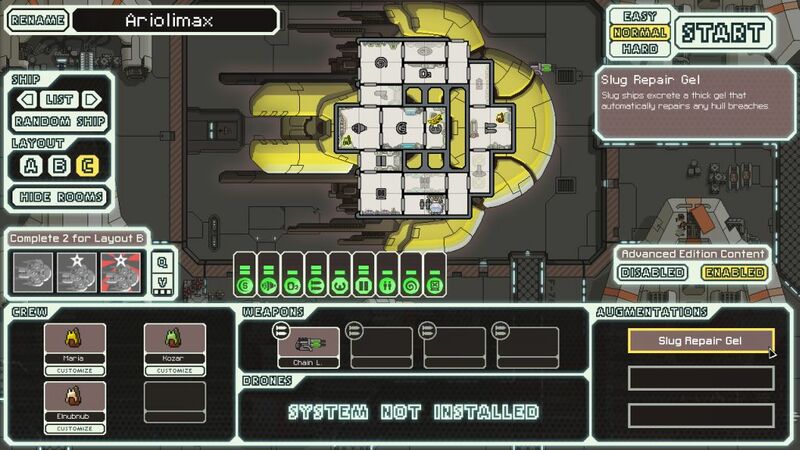 Eventually I purchased a Halberd Beam in a store during Sector Three, and that was the turning point of the run. Instead of firing two dinky little Chain Laser shots, now I could cut a beam across the enemy hull once they'd been dropped down to one shield bubble. It took a little while to farm up enough scrap for additional weapon levels, but soon enough I hit level 5 for the Chain Laser + Halberd duo, and that combined with Hacking for guaranteed hits and Cloaking for evade made the rest of the quest largely academic. I even had enough scrap sitting around to purchase a Pre-Igniter in Sector Seven, something I almost never have the chance to do. Zero damage taken on the first two phases of the flagship! This run was a lot of fun. Well worth watching.